If you have any questions about the STS BODRUM information page below please contact us. The well proportioned superyacht STS BODRUM is a sailing yacht. This 36 m (118 ft) luxury yacht was developed at Bodrum in 2001. The yacht is a recent training boat. The balanced superyacht was designed by naval architects Yucel Koyagasioglu. The yacht's general design work came from Yucel Koyagasioglu. The technical naval architecture plans are a creation of Yucel Koyagasioglu. Built at Bodrum the vessel was completed in Turkey. She was officially launched in Bodrum in 2001 before being delivered to the owner. The length of the luxury yacht on deck is 32.5 (106.5 ft). With a beam of 7.2 m / 23.5 ft STS BODRUM has reasonable room. A fairly deep draught of 3.2m (10.5ft) affects the amount of marinas she can enter into, depending on their individual depth at low tide. Having space for a maximum of 16 welcome guests overnighting, the STS BODRUM accommodates them in style. 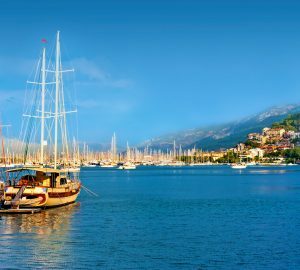 The luxury yacht STS BODRUM displayed on this page is merely informational and she is not necessarily available for yacht charter or for sale, nor is she represented or marketed in anyway by CharterWorld. This web page and the superyacht information contained herein is not contractual. All yacht specifications and informations are displayed in good faith but CharterWorld does not warrant or assume any legal liability or responsibility for the current accuracy, completeness, validity, or usefulness of any superyacht information and/or images displayed. All boat information is subject to change without prior notice and may not be current.